Goat Pie – Two Tickets to The Gun Show! Having been invited down to The Gun pub in the Docklands, on the River Thames overlooking the O2 Arena (ex-Millennium Dome), we couldn’t have arrived on a nicer day! The sun was blazing and I had the pleasure of once again meeting up with friends and Pierateers in Training Ashleigh and Olivia. It was pie time! But yes, okay, so the eagle eyed of you will have spotted that’s three people and the title says “Two tickets to the gun show”… well, let’s just say I was hardly going to call it “Three tickets to the gun show”, was I! I may not have a degree in marketing but we know how to have plenty of pun and games on the web’s leading pie review blog! And with an arsenal of gun puns ready to fire, let’s get on with the pie review! What a mouthful – and I’m not just talking about the name! 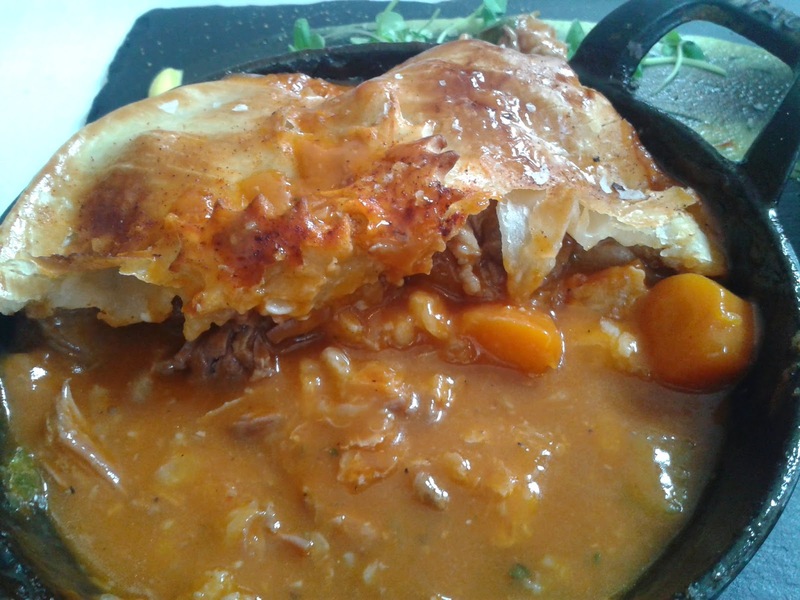 This pie had a delicious flavour to it, something I was intrigued by as I had never had goat pie – or goat full stop! Naturally this makes it the best rated goat pie we’ve eaten! But how would it rate on the 7 Cs? Capacity: 5 out of 7 – It has to be noted that this was a top crust and thus do not meet our high standards of piefection, which require a fully encased in pastry pie. However it was noted that the capacity of the dish was well filled, with lots of meat. Condition: 6.75 out of 7 – This was a delightfully presented meal; lovely and golden pastry with dishes of pie and potato, plus liquor and gravy on the side. It certainly felt like dining in luxury. Chewiness: 6 out of 7 – Apart from being a top crust, the other slight negative of this pie was that the meat was rather fatty. While the actual meat itself was nice and tender, and very flavoursome, there was a fair bit of fat on it. While this may well be a common feature of goat in general, I’d have hoped for more lean meat in a pie costing £14.50. Cheapness: 5 out of 7 – For a fancy pie meal in the heart of London, I think £14.50 was a very reasonable price to pay for a pie. Unfortunately as a top crust this did feel a bit overpriced, comparing to other pies in the London area. Content: 5.5 out of 7 – Really good flavours in the pie, with a real meaty focus throughout and delightfully cooked veg inside the pie. The fat on the meat did unfortunately detract slightly from the content though. Overall, I really enjoyed this pie meal and, while disappointed it was just a top crust, I would love to try another flavour in the future. The pie of the day is different each day, depending on what the cook decides to prepare, so I look forward to seeing what pie I eat next time! Thanks again to Barbara and Barny, who hosted us so well - a great pub to visit! And thanks to Sean and Anna for their help arranging the visit. This is a Pierate Recommended pie and they will be pleased to know no one needs to be “fired” at The Gun after this delicious pie! continue reading "Goat Pie – Two Tickets to The Gun Show!" Make a Picnic a Piecnic - Just add pie! The World's first ever Piecnic took place on Sunday 3rd August! Read the review of it and watch the campaign video in our article "The world’s first piecnic – we just added pie!" 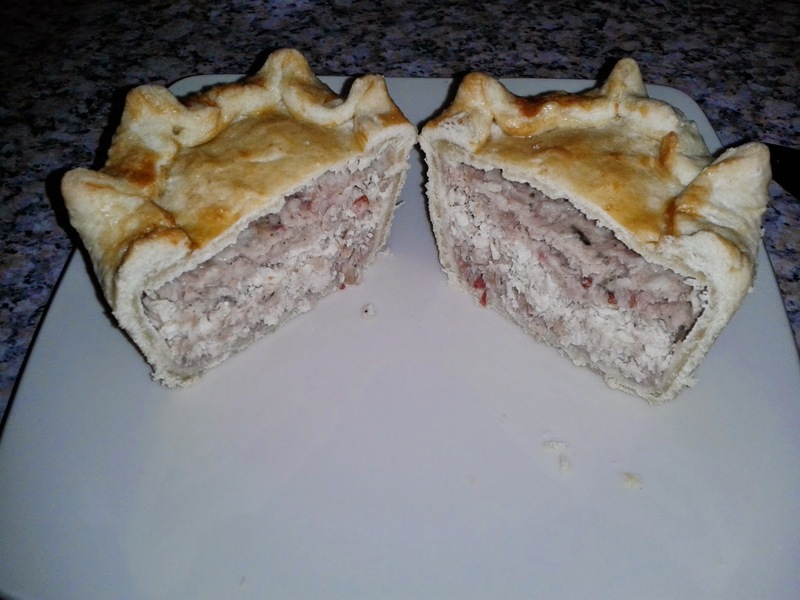 Bray's Cottage Pork Pie - a great piecnic option! All that leaves me to say is – why wouldn’t you?! Enjoy the sunshine this summer and make your picnic a piecnic. Just add pie! Why not rate your pie at the Piecnic?! Here's Chunk of Devon PIEmoting their pies for your picnic! continue reading "Make a Picnic a Piecnic - Just add pie!" On a trip to Exmoor my Pie-dy senses had been alterted to the small town of Dulverton as a place where I might locate a good pie. Okay, this isn't quite true, I can't sense where good pies are, this was a recommendation, just like many of our visits. We are very lucky to be inundated with so many recommendations we just don't have the time or money to follow them all up. 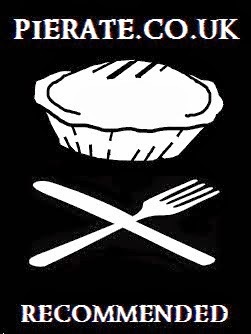 See our 'suggest a pie' page. Dulverton is a lovely little town nestled in the beautiful Exmoor National Park. With a number of independent cafes and shops it seemed that there were plenty of pie options but there was only one place for me. I was quickly impressed by the Exclusive Cake Company. Despite the name indicating their passion for cakes, it was clear that the Exclusive Cake Company are also passionate about pies. Just have a look at the huge range of pies they have on their website. It was a difficult decision, I really could only eat one pie without leading to the sinful act of wasting pie, what type of meat should I go for? I decided to go all out with the triple meat combo of Venison, Rabbit and Pheasant, known as the Game Pie. This seemed appropriate while on Exmoor which is known for it's hunting pursuits. Despite being one of the more expensive options this pie was worth the money and receives a much coveted 'Pierate Highly Recommended' award. It was meaty and delicious. Do check it out if you are in the area! See the score breakdown below. Condition - 6.0 out of 7 - This pie was ruggedly handsome. The pie didn't look perfect but had a pleasing handmade appearance with a pastry shape on top to indicate the flavour. Colour - 6.2 out of 7 - A pretty mix of different tones of golden brown. A little burnt boil out to indicate the pie is packed with content. Cheapness - 5.8 out of 7 - At £3.20 this is pretty average for a gourmet pie, but often they can be quite small. Not this one, it was really quite big for an individual pie. When you consider that you are also getting more expensive meats and that it is full of content it certainly seemed worth it. Capacity - 6.3 out of 7 - The capacity seemed about as big as possible and there was no air gap. However, there was a little bit of extra pastry on the join between the lid and sides so I felt there was slightly too much pastry. Also the sauce seemed to take up quite a lot of the space, but there was enough meat. Chewiness - 5.5 out of 7 - The chunks of meat provided plenty to get your teeth into without being chewy. The pastry was nice and flaky on the outside without being puff pastry. (This reminded me of my favourite pies from Kings Farm.) It was crunchy on the outside and soft on the inside, a great combination. However, it was a little bit dry at the edge which meant my teeth had to do more work than I would have liked. But this was only a small proportion of the pie. There was a bit of a strange texture to the sauce, it was so thick it was almost like jelly (as we have found elsewhere). Whilst not chewy as such, the texture was not what I would have chosen, I like thick sauce, but prefer it not quite this thick. I would note this did only have a small impact on my enjoyment. Content - 6.9 out of 7 - Pure and simple, this was a great tasting pie. Very meaty and no nonsense. The game meat added plenty of flavour, with the venison being particularly apparent. Even the pastry tasted nice. If I had to criticise the taste of the filling I would say it seemed a little too salty to me which reminded me of a Pukka Pie. Consistency - 5.8 out of 7 - Despite not being consistently perfect, overall the taste of both the filling and the pastry made this pie stand out and they worked well together. continue reading "Delving into Dulverton Pies"
Yes, we may be accused of being a tad pie-ased but let’s face it – Haggis aside – is there anything more Scottish than a Scotch pie? Really??? And yet it pains me to say that the Tunnock’s Tea Cakes dancing all over the stage of the opening ceremony grabbed all the newspaper headlines, when surely – surely – we should have been reading headlines about dancing scotch pies!!! 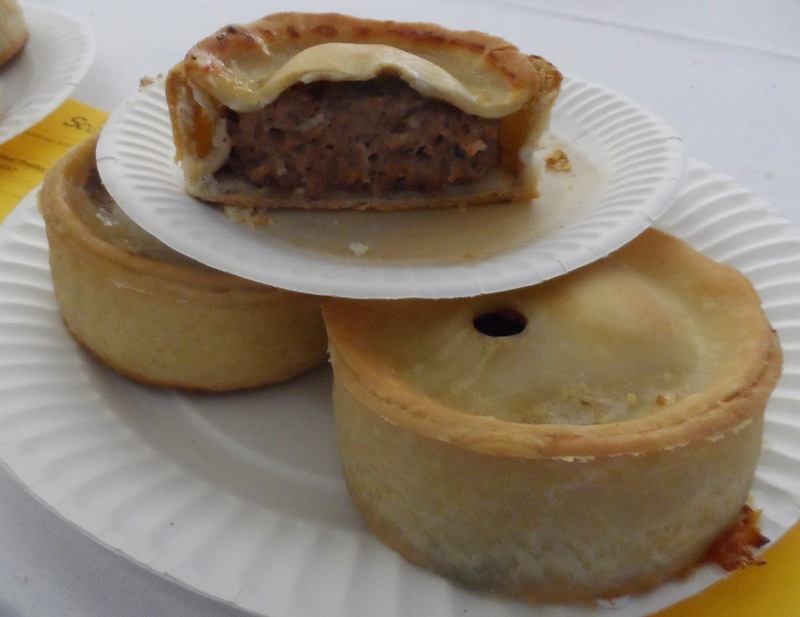 So to address this, as the Commonwealth Games kicks off, Pierate are giving Scotch Pies the pie-de of place they deserve as the most important food export Scotland has – yes, aside from Haggis!!! For a beginners guide to the Scotch Pie look no further than our article “What Makes The Best Scotch Pie?” featuring an answer to the million dollar question “What is a Scotch Pie?” and our Scotch Pie Rankings Table. 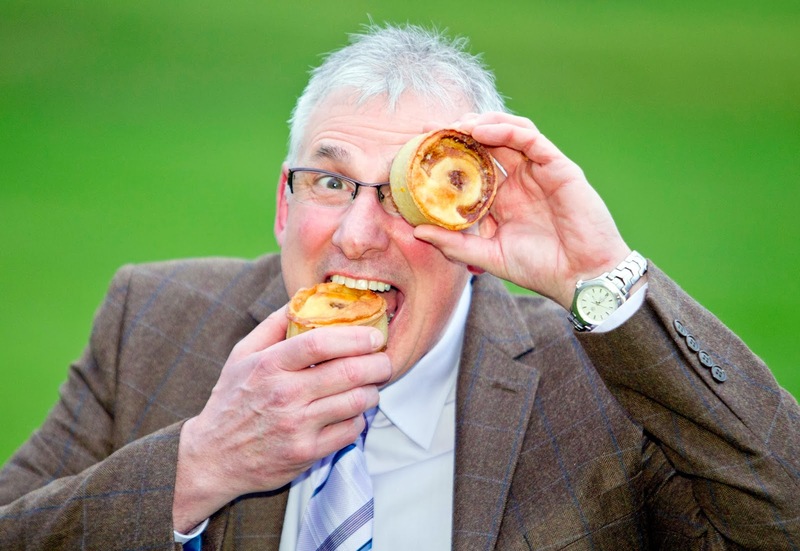 While in Scotland for the Scotch Pie Club awards 2014 we took the opPIEtunity to rate the World Scotch Pie Champion 2013 from JB Christie – and boy did it rate well! 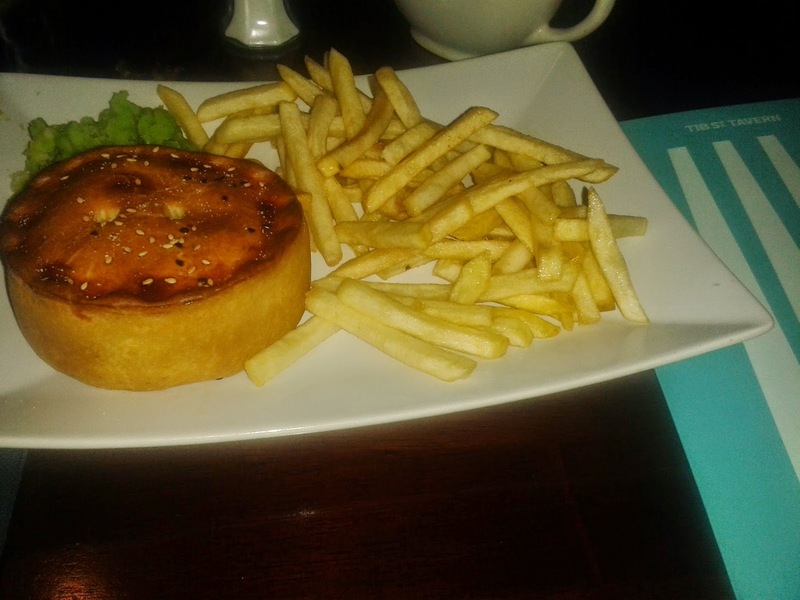 Read our pie review of this Pierate Highly Recommended Scotch pie. You don’t have to go to Scotland to eat a proper Scotch Pie – Paul the owner of Piebury Corner on Holloway Road, London travels 500 miles (and then 500 more, on the way back) to pick up Scotch Pies from Scotland and sell them in his pie shop. 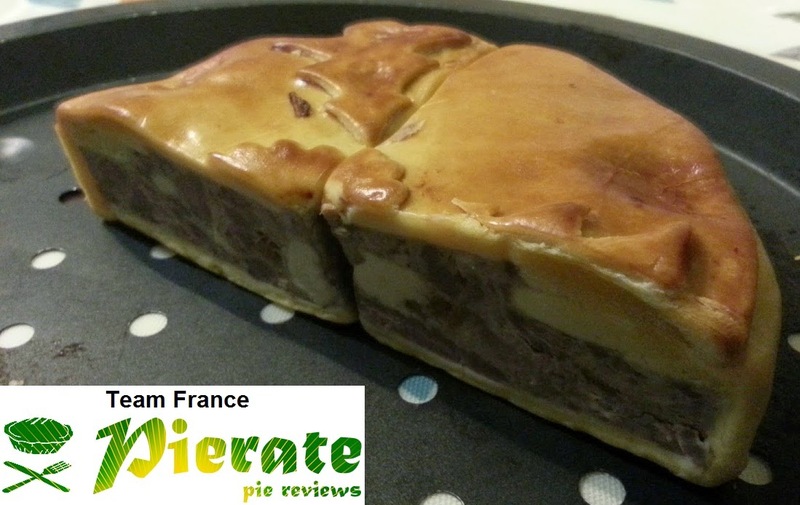 Pierate Recommended – read the pie review here. Our Ship’s Cook has made a Scotch Pie using McSingh’s recipe – find out how the recipe rated and what she thought. 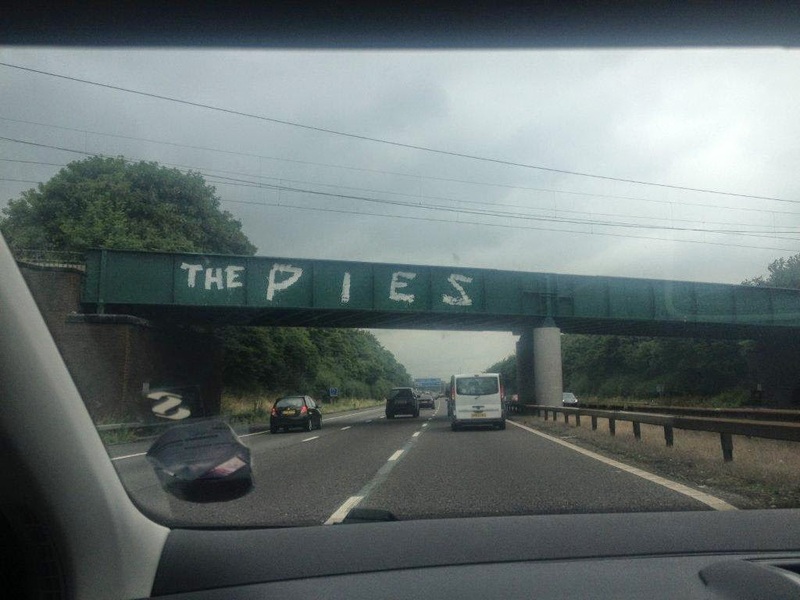 continue reading "Commonwealth Games: Scotch Pies Review Special for Glasgow 2014"
With a number of photos like below doing the rounds on twitter, the Pierateers felt they should clarify that they are NOT behind a "The Pies" bit of graffiti on a road bridge near Chester. Pierate can officially confirm we were not doing a Banksy and adding pie signage to road bridges up and down the country. If we'd been thinking of doing such a thing, we would certainly have put either "Pierate" or "We rate all the Pies" - our policy summed up brilliantly in our article "Who rate all the Pies?" which was produced just prior to British Pie Week this year. Due to overwhelming views of this article we have decided to do some research on this piece of graffiti and it appears there is a history to it! Find out more in our latest article on pie graffiti. 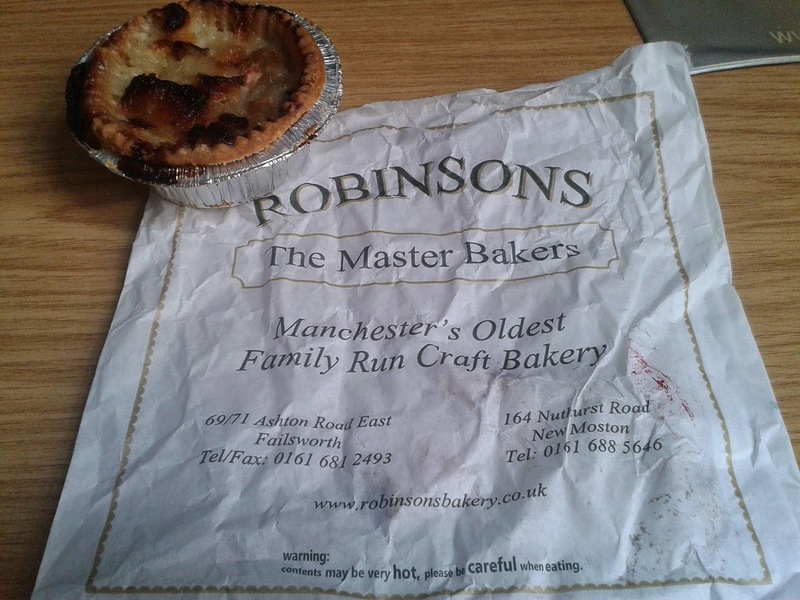 continue reading "Official Statement regarding "The Pies" Graffiti"
We recently had the pie-leasure of visiting Robinsons Bakery in Failsworth, north Manchester, as part of their 150 year celebrations. Yes, that’s right – one hundred and fifty years of pie making in Manchester’s oldest craft bakery. It’s still family run and – having rated their mince pies very highly in their 149th year – I was delighted to get a tour round the bakery and try a few more of their pies. Robinsons Bakery Pies - 150 years old! Having already tried their mince pies, I wanted to give their meat pies a rating. You won’t be surprised to see I went for their steak pies, given how strongly they feature at the top of our pie rankings. The pies in question were the Steak and Guinness Pie and the Steak and Kidney Pie, while I was also kindly given an apple-topped pork pie to rate as well. The pies were all decent value at just £1.50 each – could have been slightly bigger though with a bit more content to make them a meal. We ended up eating 2 meat pies each for dinner, indicating they are more snack size than meal size. Mind you, we are piefessionals. Both the Steak and Guinness and Steak and Kidney pies were reasonably well filled, though they could have had a slightly stronger capacity. 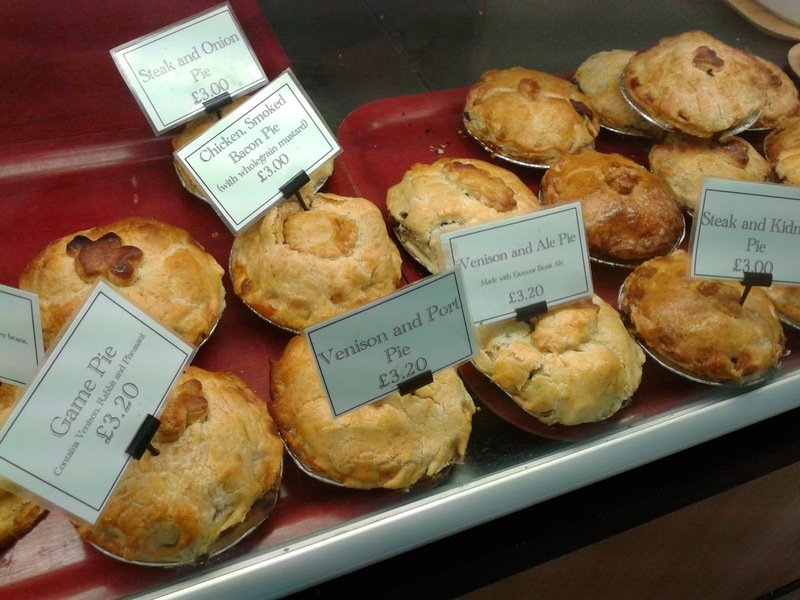 The pies did vary slightly in capacity between the pies we got – as we had bought 5 of each flavour – which indicates a slight inconsistency in the filling levels but is not surprising when they are all handmade, rather than industrially filled. The colour was quite golden on them all and they held together well, despite quite a bit of travelling being done by the pies! The bases of the pies were a little softer than the crisp lid and sides but this did not detract from the taste of the pie too much, with the pastry lid on the steak pies being particularly nice. The Steak and Guinness pie was the first to be eaten and was quite well filled with tender chunks of steak. There could have ideally been a bit more steak in the pie and the pie was overly peppery, but in general the Guinness gravy complimented the steak well and at just £1.50, this was a good value pie. The pastry was quite crisp and the pie held together well, so with a bit more steak and bit less pepper inside it would be a very well rated pie. 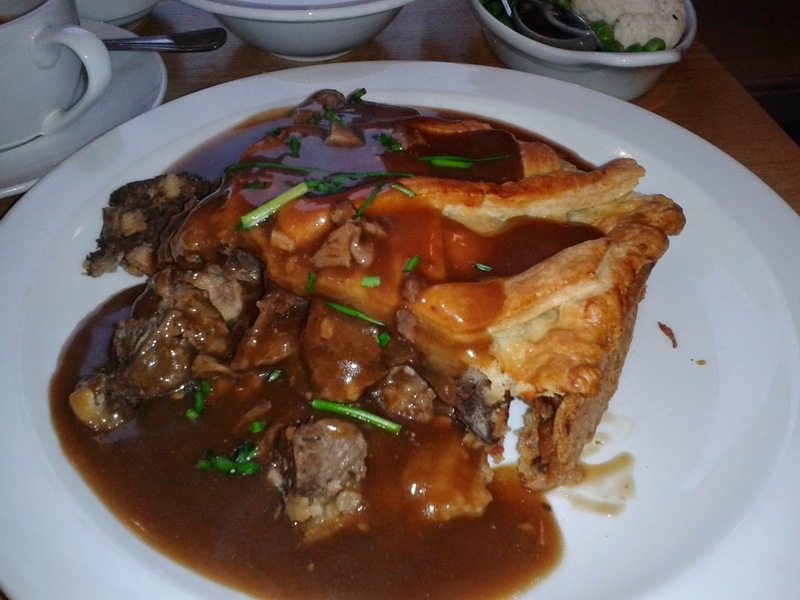 The Steak and Kidney pie was reasonably well balanced between the steak and kidney, with a nice gravy. The pie I rated was nicely seasoned – not overly peppery like the Steak and Guinness – so was a lot more enjoyable in flavour. I would have preferred a bit more of a weighting towards the steak but the flavour was good. £1.50 was a decent price for this pie and it was a bit better filled than the Steak and Guinness, but a bit more filling to maximise the capacity would have been ideal and bumped up the score by improving the pastry:filling ratio. Unfortunately as this pork pie was topped with apple, not pastry, it was not a fully encased pie. The apple layer was reasonably thick, giving a strong tang to the pie and in my opinion was a little too strong. The pork was reasonable quality, though for a top rated pork pie I would expect a bit better. The condition wasn’t perfect on this pie – most notably because it wasn’t fully encased - but the pastry was quite nice, crisp and held the filling in well. In summary I could see why this was a strong seller from the bakery but it loses marks with us as it’s not fully encased. I would say it was a bit too sweet for my pallet and the meat could have been a bit more flavoursome. With such a strong score for their mince pies (who even featured in our Christmas pie music video! ), it was always going to be a hard act to follow for their meat pies. But at just £1.50 each for a hot pie, this is excellent value and I would happily eat again. Both steak pies are Pierate Recommended. While their apple-topped pork pie wasn’t quite for me, I’d look to try a traditional pork pie from them on my next visit. All in all, the hard craft of pie making is in safe hands 150 years on from the first Robinsons Bakery pies! continue reading "Steaking out at Robinsons Bakery"
Well there we have it. The World Cup is over for another four years. But if you’re already suffering from World Cup withdrawal, never fear – I’ve got a pie recipe to remind you of all those good times in Brazil. I made these for a family barbecue and can strongly recommend eating them outside with a nice cold beer, but the leftovers also made a pretty good snack during the World Cup final. WARNING: These pies contain turmeric which can be pretty hard to get out of clothes/cushions etc. so you’re probably best not giving them to anyone who’s likely to jump out of their seat with excitement while watching the match and fling their pie across the room. Pierateer RAS suggested I give this recipe a go, and I’m glad I did because it’s certainly an interesting one, with unusual pastry and a pretty unique choice of pie filling. The chicken mixture is pretty close to an Afro-Brazilian dish called Chicken Xim-Xim, which is a chicken stew with peanuts, shrimp and peanuts. Don’t be put off by the long list of ingredients – it’s not as complicated as it looks and the finished product is well worth the effort. I really liked the colour of these pies – I baked them until they were golden brown but the turmeric in the filling leaked out a little bit and added a lovely yellowy colour to the edges of the pastry, which made these pies look very appealing. The liquid in these pies is a mixture of coconut and chicken stock, so it’s more of a creamy sauce than gravy. The consistency of the filling reminded me of a creamy curry only thickened for longer – it went very well with the crispy pastry. As with all homemade pies, you can stuff the pastry as full of delicious filling as you’d like. This meant that my pies scored pretty highly for capacity, but I did make a small error - the original recipe suggests that you bake your pies in muffin tins, but I decided to use jam tart tins and make lots of smaller pies. They were still tasty, but I think the Crust:Filling ratio would actually be slightly better in a bigger pie. That’ll teach me to think about quality rather than quantity next time I’m baking! The pastry in this recipe, which is made with lard, eggs and egg whites, is very crispy on the outside and chewy on the inside. The filling isn’t chewy at all, just lovely and creamy with the occasional crunch from the peanuts. Yum. When I first saw the long list of ingredients for this pie, I thought it was going to be pretty expensive. However, I was pleasantly surprised – thighs are a cheap cut when it comes to buying chicken, and ingredients like ginger and chillies can be bought in small packets or individually to keep your costs down. You also get quite a few pies for your money – I made 24 with pastry and filling to spare, so if you stick to using a muffin tin I think this recipe would easily make 12-16 pies. This recipe is definitely a high scorer when it comes to content. It’s unusual and very, very tasty. Even better, the filling is already a meal in itself, so it’s a meal that’s been improved with a pastry case. Perfect. These pies come out of the oven in great condition. The have a lovely rounded shape because you press them into the tin rather than cutting out the pastry, and they also have a nice solid feel to them. To make sure they’re absolutely perfect, take them out of the tin while they’re still slightly warm, otherwise the pastry sticks a little bit. continue reading "Reci-pie Review: Brazilian Pies "
You may recall that in May 2013 (blimey, was it that long ago?! 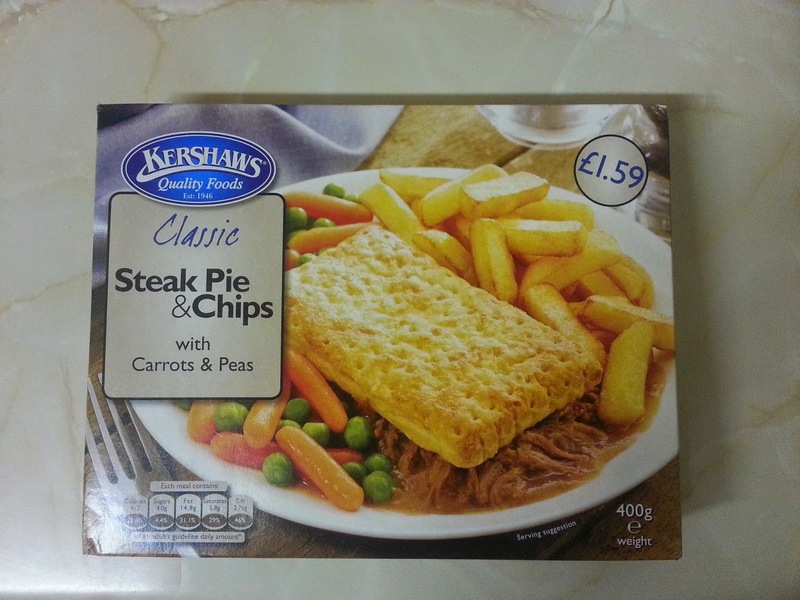 ), I reviewed a microwaveable Kershaws Luxury Steak Pie. Needless to say, the pie didn't score well on our criteria. In my opinion, not only did the top-crust pie look terrible but it also failed to live up to its "luxury" status in any sense of the word. I finished the pie, and thought that would be the end of it. But the Kershaws steak pie has reared its head again, for I spotted this item in the freezer section of a small superstore. The ready meal pie is back, and with a vengeance. It's back, in a new form. And 9p more expensive. I know what you're thinking. 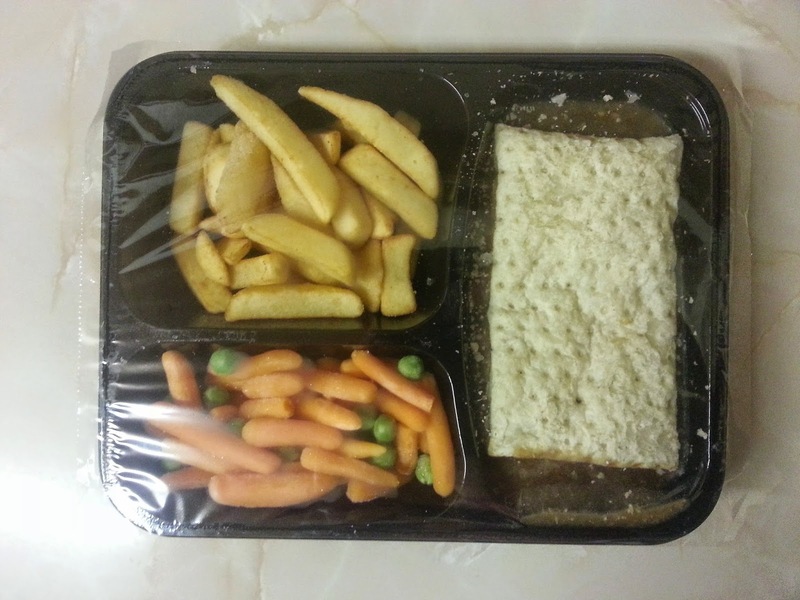 It's a steak pie and chips, with carrots and peas - same as before - so what's the difference? Well, this pie is billed as a classic steak pie, in contrast to the luxury pie I reviewed before. Other than that small difference, though, the pie looks virtually identical. But my Pierate colleagues (thanks guys) assured me that I really needed to try this pie, just to be certain there was no difference. Unsurprisingly, this filled me with fear. If the luxury pie lurks down near the bottom of the pie rankings, what on earth is this classic pie going to score? Opening up the cardboard packaging, the pie looks much the same in its plastic ready meal packaging. Once blasted for 11 minutes (11 minutes!) in the microwave, the pie is ready on the plate. And wow, what a sorry sight. Even for £1.59 (note: 9p dearer than the luxury offering), in my opinion this is a depressing plate of food. I just don't know how you can call that a pie. And why does the rectangular slab of "lid" have weird machined dimples in it? Yep, I'd recognise those scary cubes of meat from a mile off. This has got to be the same pie as the luxury one I ate last year. Even the chips and veg are the same. So what's happened? Has Kershaws possibly, potentially, just perhaps, maybe taken our comments on board, and changed the name? It's unlikely, but we can dream. I won't give it a new rating, as I'm really rather sure that it is the same pie as before (although you can never be 100% certain). But I will say I still think this pie is just as bad as when I first tried it - with a rating of 1.2/7. 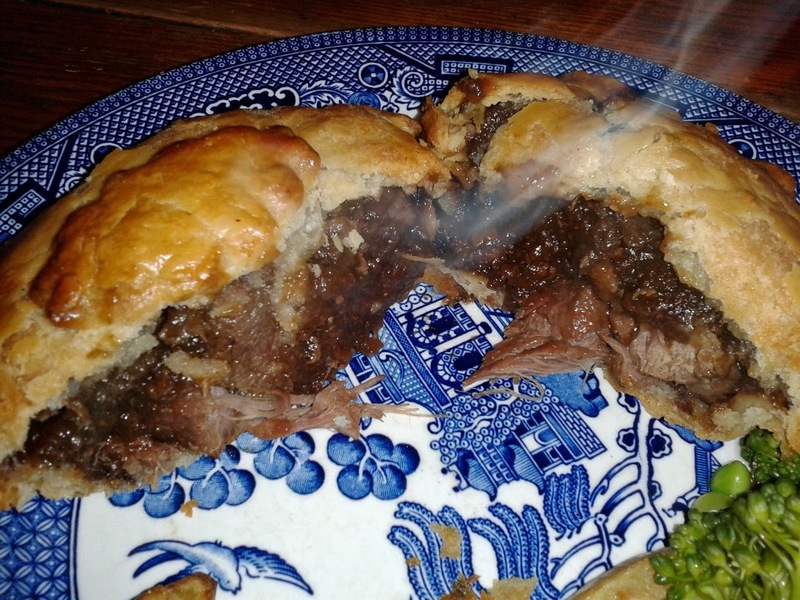 continue reading "The not-so-glorious return of the shapeshifting steak pie"
Is Holland’s Steak and Guinness pie the perfect match? It seems only right that as I dug into my Holland’s Steak and Guinness pie on a Saturday night in July, in front of me Holland’s players were cruising to third place at the 2014 World Cup in Brazil. Crisp, neat finishing, decent content and hitting the back of the net. And the football team didn’t play too badly either! Did you know we had a sneak preview of Holland’s formation before kick-off, revealing they would be filling the midfield? That and more on our World Cup 2014 Pie Blog. The pastry was firm and crisp, although I would have preferred a slightly lighter, flakier top crust to balance out the very nice shortcrust sides and base. The colour though was good too and, while the edges did crisp up a little more than the centre of the lid, the condition was good too. The pie even seemed to be enjoying Holland’s performance on the pitch, breaking into a little smile! These Holland's Pies seemed quite happy with Holland's 3-0 win! It was however a little shallow as pies go, meaning it didn’t have quite the ideal pastry:filling ratio, but the filling was very good and with a little more meat it would have been close to being spot on. The Steak and Guinness combo we know works well (after all, our current number 1 pie is also Steak and Guinness flavour!) and the flavour of this pie was what pleased me most about Holland’s effort. The gravy was just the right consistency and quantity, which is important for the flavour. I was also pleased that it wasn’t loaded with pepper, as the Holland’s Peppered Steak Pie I rated at the Emirates Stadium was a bit too seasoned! I’d certainly be very much up for enjoying another of these Pierate Recommended pies soon and will look out for them, priced at a very affordable £2 (RSP) each. Thanks once again to Holland’s Pies and Christine at Mason Williams for providing the 28 pies, which will primarily be enjoyed at half time of the World Cup final! 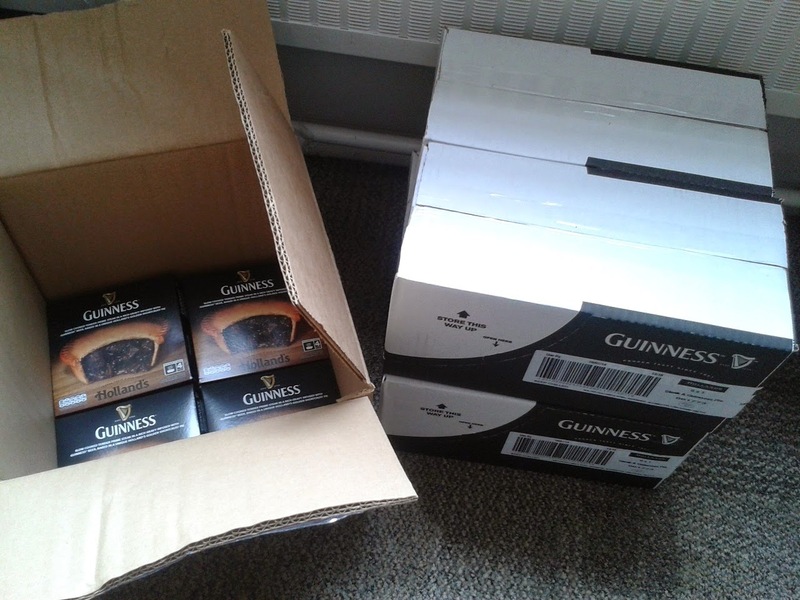 continue reading "Is Holland’s Steak and Guinness pie the perfect match?" I moved to Gloucester in October last year but have yet to review a pie from the city itself. This is partly because of the wealth of good pies to eat elsewhere and a massive backlog of pies to review. The trip to Scotland to get my teeth into the best Scotch pies didn’t help. But the sad truth is that I have eaten some pies in the city, but they just haven’t made the cut when it comes to being review worthy. All of us Pierateers eat a lot of pies and unfortunately there just isn’t time to give them all a review. Sure enough, a really good or bad pie will get a review but often I won’t even add some of the middle or the road pies to my list of pies to review. They just aren’t interesting enough. Why have the pies in Gloucester failed to inspire me? Well to put it simply, they AREN’T PROPER PIES! Sorry, I seemed to get a bit worked up there…. I would apologise, but I can’t help myself, I get so worked and disappointed when I order a pie only to find out it is a casserole with a pastry lid and Gloucester seems to be full of these ‘top-crust’ pies masquerading as the real deal. 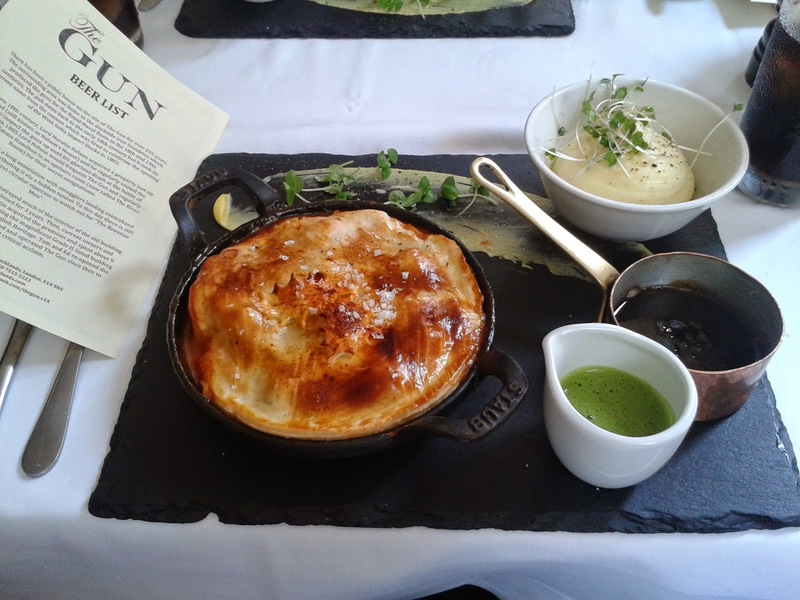 Upon a trip to Gloucester Quays I was delighted to find a proper Game pie on the menu of The Barge restaurant. This is a nice settling amongst the historic Gloucester docks. Although I am not particularly interested in the designer outlets I am really pleased that the historic warehouses have been saved by being converted. There are still some areas where the old warehouses are falling down and I hope the money will eventually be found to convert these too. You start to get an idea of why Gloucester was once such an important city. The canal made the Quays the most inland docks in the country, quite an advantage in those days. I would worry that The Barge is slightly hidden away, a little distance from the main shopping and restaurant area and that they might struggle for custom. Perhaps this suits them. It was quite a charmingly small restaurant, with only a few tables. I found it a nice place to eat, the proprietor didn’t mind that we stayed for a long time, tired from wandering around Gloucester and the Folk Museum. The pie was pretty decent, both the pastry and filling were different to your standard pie, which is good as it made it stand out, but there was room for improvement. I was very impressed by the fact that it contained 4 different meats, Venison, Beef, Pheasant and Pigeon. The fact that it was a slice of a bigger pie, rather than a whole, smaller pie is not my preferred choice but I did enjoy it. See the scores below. Condition – 4.2 out of 7 – Well presented which can be difficult when cutting a slice of pie. I would have prefered to pour my own gravy. Colour – 4.0 out of 7 – I couldn’t really distinguish between the colours of the meat, it looked slightly homogeneous but the pastry had some pleasing golden brown. 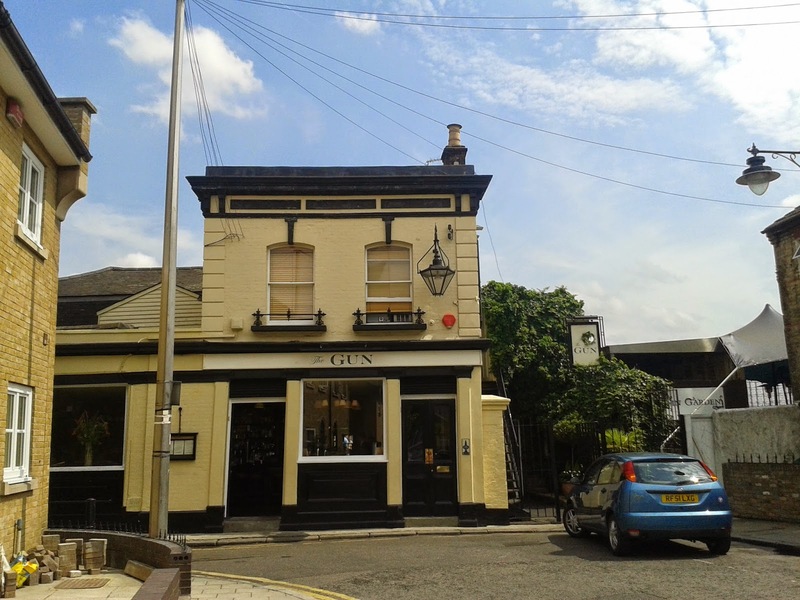 Cheapness – 5.5 out of 7 – I thought for £9.50 this was a great value meal in a nice location and setting. The amount of food was immense, especially for more expensive game meat, it was a huge slab of pie. Capacity – 4.5 out of 7 – This piece of pie had a great capacity because it was so big plus it was well filled. However, I think there was a bit of a lack of pastry if anything, because it was a slice of pie it seemed to miss out the optimum ratio. 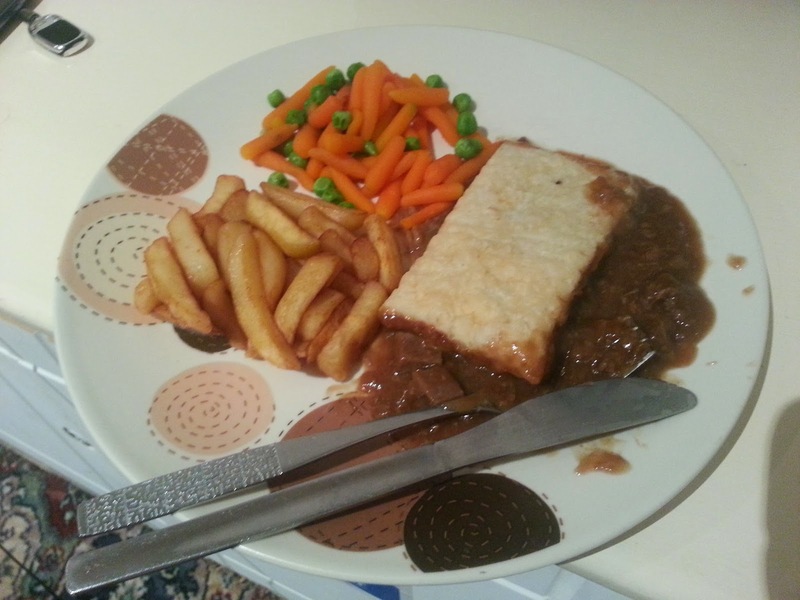 Chewiness – 3.5 out of 7 – There were some unusual textures going on in this pie, not always in a good way. The pastry was a little bit like bread which I didn’t like and the crust was a bit dry . The worst part was that the base had absorbed the filling and turned into a bit of a soggy mush. On the plus side, most of the meat was soft, except the pieces which I think might have been the pheasant which were a bit dry. Content – 5.5 out of 7 – The pie was a real meat feast, I couldn’t tell the difference between the pieces of meat by looking at them but I could taste it. It is unusual to find so many types of meat in one pie and I certainly appreciated it. It was all very flavoursome in a rich meaty sauce. Despite being so big I didn’t get bored of eating the meaty chunks. There was a bit of a taste of biscuit from the crust which was a little weird. Consistency – 4.0 out of 7 – A bit of a mixed bag which almost, but didn’t quite, work. It is something I would recommend if you like your pies meaty but I wouldn’t plan to try it again unless the pastry was improved. continue reading "The Quay to Winning the Gloucester Pie Game"
You might have noticed we love Paul’s Pies. We have been banging on about them for some time now. See below our list of Pauls Pies reviewed so far, two of which are currently occupying spots in the top 3 of our pie rankings. Wow, would you look at that? Six pies all achieving Pierate Highly Recommended (6 or above) or Pierate Recommended (5 or above). If you are very keen on our blog you might have noticed two pies in the list which haven’t yet been reviewed! How can that be? Well, I am about to review them both, right here, right now! I am feeling pretty privileged to get in there first with two of these beautifully boxed pies. And now for something different from the other Paul's Pies I have tried before. This is a pie that is designed to be eaten cold, perhaps a bit like the Christmas offering, however, I was delighted that this one has a pastry lid. For some reason this pie came in a different box with no window. It also cost a whopping £4.75 for the 270g pie which meant it would have to do something a little special. 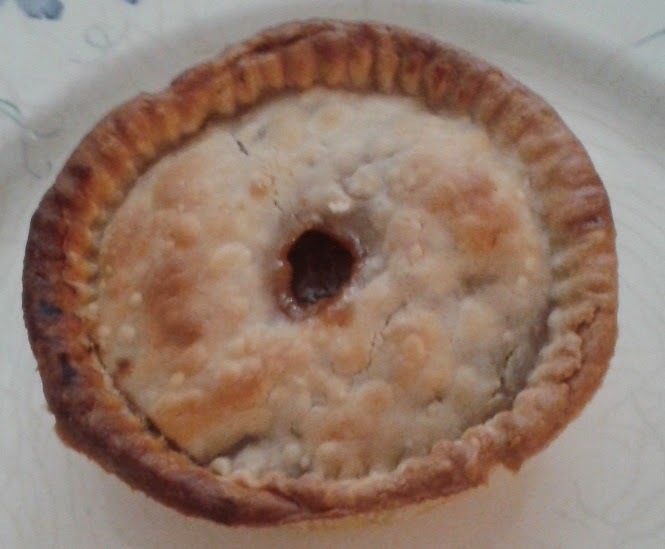 Condition – 4.9 out of 7 – It had a similar shape to other Paul’s pies with lovely crimping at the edges. I did miss the pastry letter on the top and the colourful boxes that Paul’s pies normally have but these are only minor points. Generally top condition. Colour – 4.5 out of 7 - The pastry looked nice, but could have been a bit more golden. The filling was very pretty, being layers of Pork and Chicken. Capacity – 4.7 out of 7 – Tall and proud, exactly what we expect from Paul’s pies; there was a large capacity. This one was a bit let down by the surprising addition of an air gap at the top although not very large. Cheapness – 3.5 out of 7 – I understand that this is top quality meat and this was full of meat but £4.75 just seemed like a lot for quite a pie which is the same size as the normal Paul’s pies. 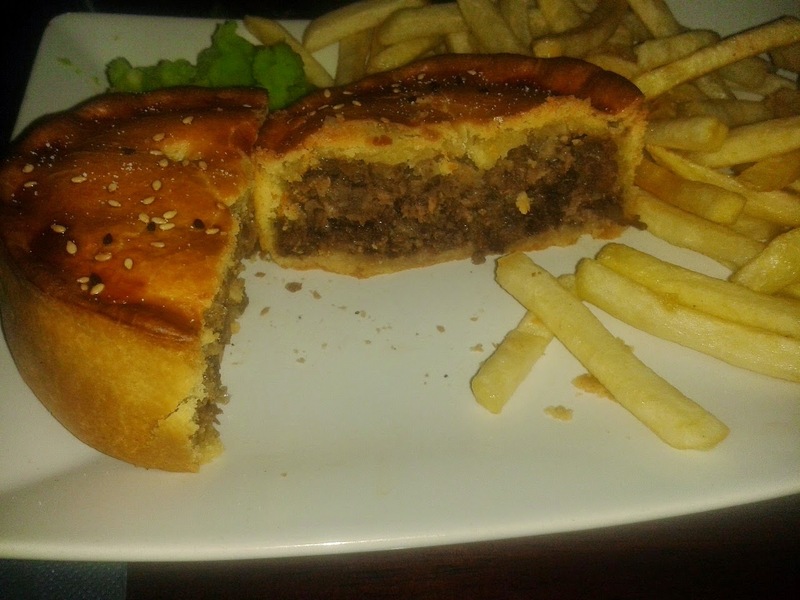 Chewiness – 6.0 out of 7 – The meat in this pie was unlike any other I have had, it was so moist and light and flaky. Great care had been taken to avoid something as heavy and stodgy as you normally find with a pork pie. In fact, this is nothing like other cold meat pies. There were some small chewy pieces to the pork. The pastry was heavy on the fat content (in a good way) which made it also really soft to eat, despite being shortcrust. Content – 6.0 out of 7 – I thought that this pie tasted great, it tasted a bit like a really awesome version of a sausage roll. There was plenty of seasoning with hints of flavours you might expected with roast dinner stuffing. The flavours were similar to Mr C’s chicken pie. There was a wonderful richness to the pastry. Having both Chicken and Pork kept the meat interesting. I would note that my Dad didn’t like it, he thought it was ‘too spicy’ but he is Mr Bland and Boring so I tend to discount his views. Consistency – 5.5 out of 7 – A nice consistency and a tasty morsel which did something a bit different from the norm and pulled it off. Just wish it was a bit bigger because I don't think it would go very far sharing it at a picnic. You could buy more than one but that would leave the rest of the hamper a bit bare on most picnic budgets. 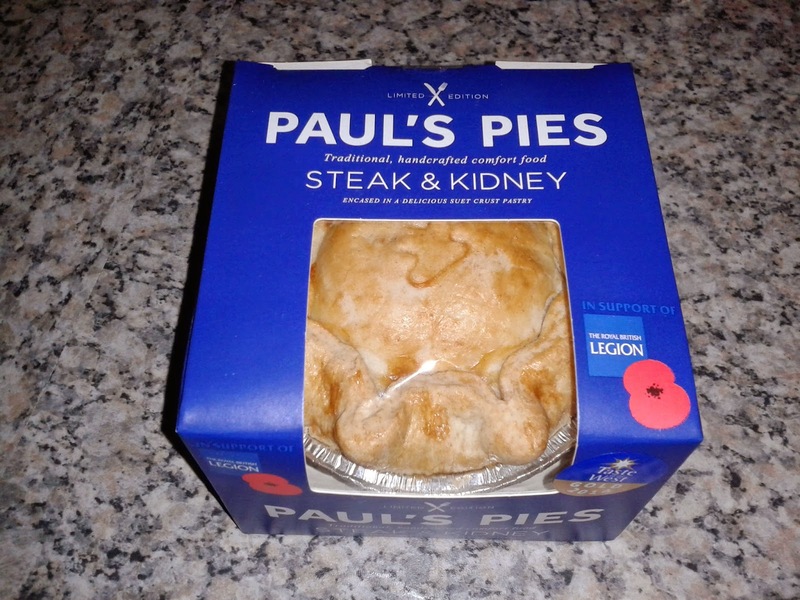 To commemorate World War 1 and as a way to raise money for the British Legion, Paul has brought out a limited edition Steak & Kidney pie, similar in style to his other meat offerings like the Steak & Guinness. Colour – 6.5 out of 7 – Wonderful hues of glossy brown as we have found from the best of Paul’s Pies. Capacity – 4.1 out of 7 – Again, a tall pie so a good capacity. However, this was the first time I have found a significant air gap at the top of a Paul’s Pie. I think I was just a bit unlucky with this one as we haven't had this before. Cheapness – 4.5 out of 7 – This pie was priced at the same level as most Paul’s Pies, at £3.50, which is pretty much the going rate for an individual gourmet pie. 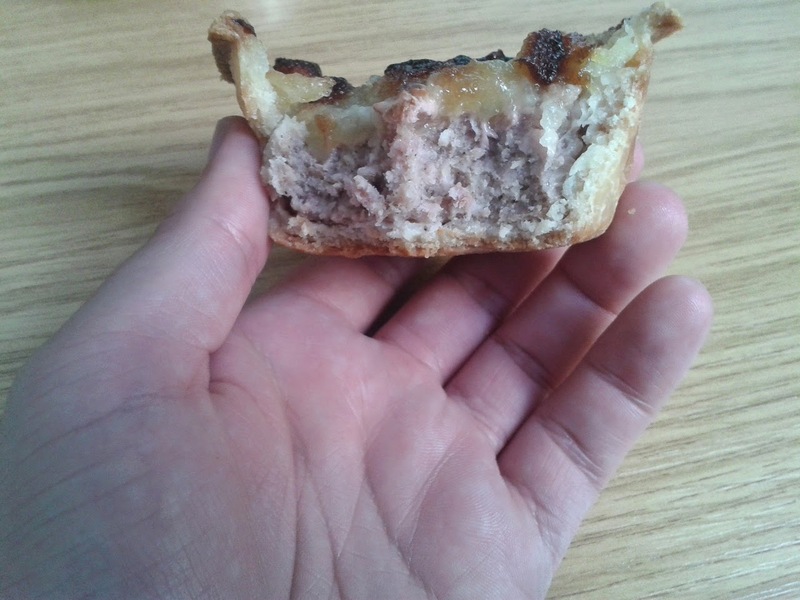 Chewiness – 5.5 out of 7 – The meat was soft but slightly more chewy in places than other Paul’s pies I have had. This wasn’t necessarily a really bad thing, it gave me something to get my teeth into. The kidney was soft as would be expected. It was a pleasure to again have Paul’s lovely suet pastry with it’s crunchy outside and soft middle. 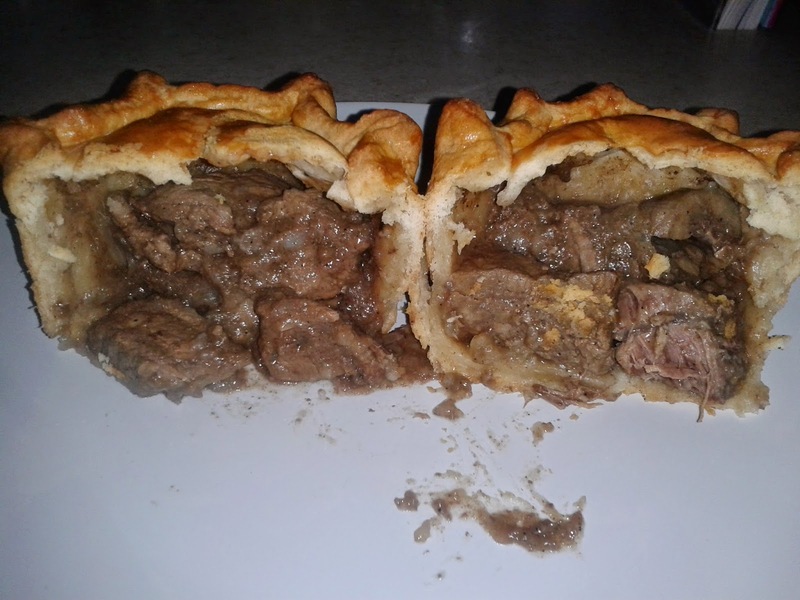 Content – 6.0 out of 7 – The flavour of this pie wasn’t adventurous but captured that classic, British, homemade Steak & Kidney flavour perfectly. 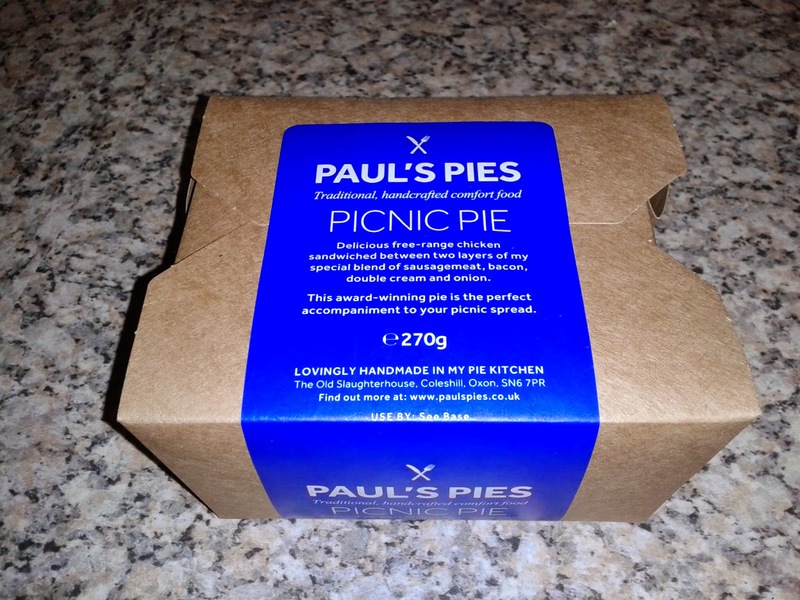 Paul’s Pies have a wonderful knack of creating comforting and homely food. The kidney flavour wasn’t overpowering as it sometimes can be (we aren't huge fans of kidney on the Pierate Ship). Consistency – 6.5 out of 7 – The lovely thick sauce gave this a great consistency. It worked very well as a pastry package. Overall two very good pies from Paul, fully deserving of ‘Pierate Recommended’ awards. The Steak & Kidney would probably have scored higher if it wasn’t for the airgap, not something we have ever seen before from Paul’s Pies. Unfortunately these things happen sometimes when making large numbers of pies, from manufacturers small and big. This will require further investigation, someone will have to eat more Paul's Pies. Naturally I volunteer myself, it's a tough job, but someone has to do it. continue reading "These Pies Have Got It Paul"
Food delis tend to be pretty upmarket but Brompton Food Market in affluent South Kensington is one of the most posh. We love to try a broad range of pies, some cheaper, some more expensive as you never know which are going to be the best value for money. I thought I simply had to try one of the pork pies on offer at Brompton Food Market, at £3.50 for a small pie I was expecting something good. There were a few variations on offer but I decided to go for the standard pork pie. They said they are made by a company called Bray's Cottage. See below for a breakdown of the score. Condition – 6.5 out of 7 – Very nice indeed, a lovely zigzag pattern around the top and some odd holes which look like air vents but aren’t. There wasn’t much that could be improved in the condition. I don’t often say this for a cold pie but this pie had a lovely, spicy aroma. Colour – 6.8 out of 7 – I really liked the glossy golden colour to this one. There was nice variation in the glazing which made it look handmade (but I don’t know if it was) and there was some evidence on the outside as to the juicy filling on the inside. Cheapness – 3.0 out of 7 – For an individual sized pork pie this just wasn’t cheap at all but you do get what you pay for. This is good quality pork. Capacity – 5.8 out of 7 – The pie was quite tall so the capacity was large for its size. It was completely full of content. 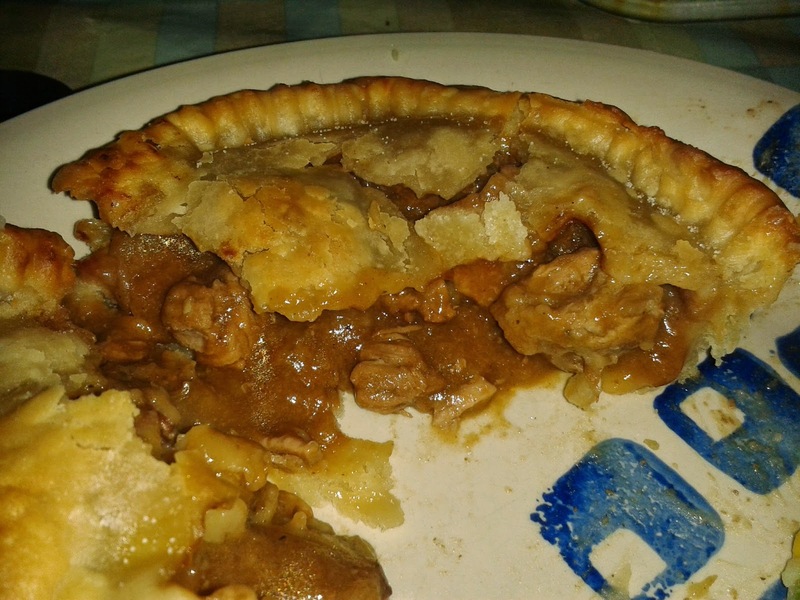 Chewiness – 6.4 out of 7 – There was a great texture to this pie, only one tiny chewy piece. The pastry was softer than many pork pies but still had a really satisfying crunch to the outside. The filling was granular and not at all mushy. This pie didn't seem to have any jelly but was still very moist. Content – 5.9 out of 7 – This pie was filled with proper grey pork meat rather than cured pork, in a similar way to a Melton Mowbray Pork Pie. Although, there did also seem to be some pink bits to it which I now realise is because they mix in some smoked bacon! This is a nice touch and makes this pie stand out. The pork had some of the best flavour I have ever had in a pork pie. I was however expecting it to have a bit more spice to it. Maybe it is because they didn’t want to hide the flavour of the meat but for me, I like a bit more of a peppery taste. There was a really great flavour to the pastry. I am not sure what they used to glaze it but there was almost a sweetness to the taste which I loved. Consistency – 6.5 out of 7 – This really worked well as a package, in many departments I would say this would be my ultimate pork pie. 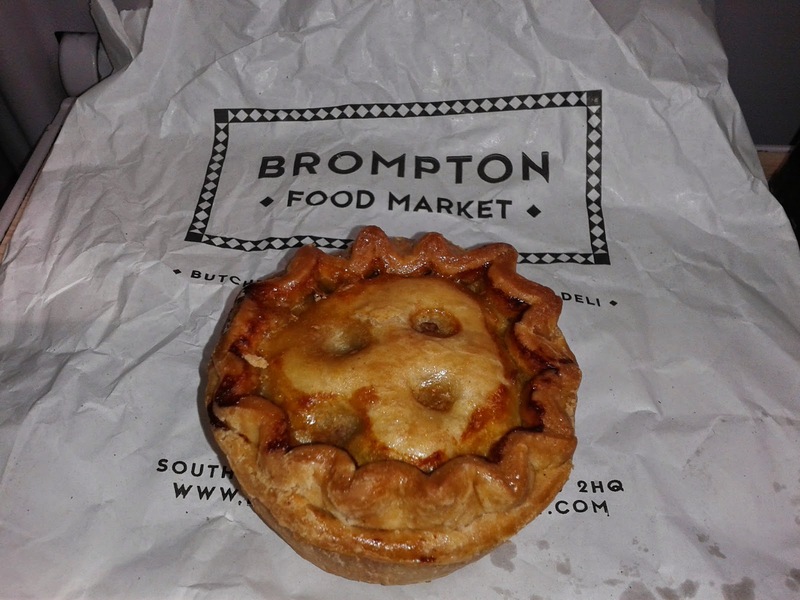 Overall, a really very good pie from Brompton Food Market. However, for £3.50 it seemed a bit much, for me it is hard for any individual pork pie to justify such a price, no matter how good it is. I would expect the best I have ever tasted. In fact, it almost was the best I have ever tasted so not a bad effort. The seasoning is probably a personal preference anyway. If you can find these pies sold elsewhere, perhaps a bit cheaper, then they are well worth a try. 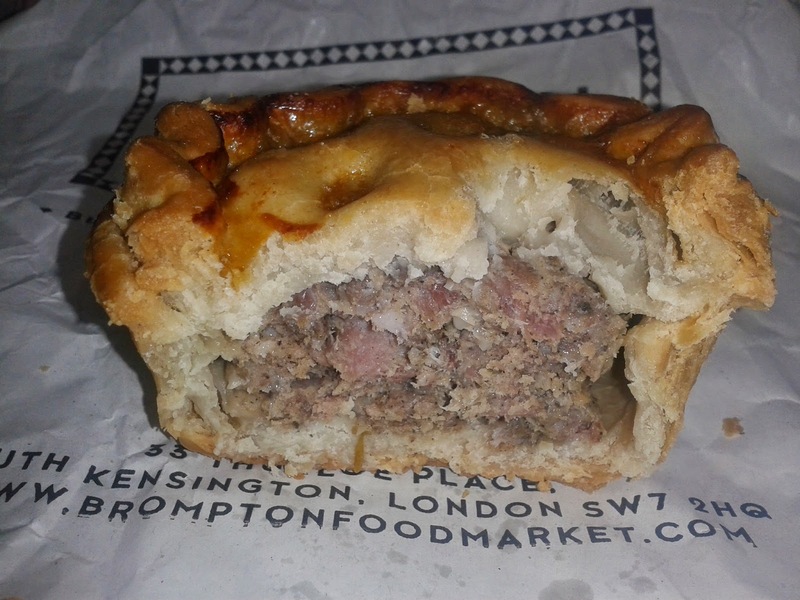 continue reading "Bray's Cottage Pork Pie at London's Brompton Food Market"
How Great is the Great North Meat Pie? Those who are regulars to Pierate will know we recently looked at whether Great Britain really has got pie talent. And it came as no surprise that it was a resounding yes! But we hadn’t yet got our hands on a pie from the Great North Pie Company, who are literally putting “great” into their great pie names! So when pitted against the 7 Cs of pie rating, could they deliver? Rounding off my Manchester #PieTour was a trip to Tib St Tavern – surprisingly enough on Tib Street, central Manchester. A lively city centre hangout, particularly on a sunny Saturday evening with the World Cup football on, the Tib St Tavern serve up pies from the Great North Pie Co alongside a range of other bar snacks. The pie offerings seem to change daily, with the specials board upon arrival indicating what pie offerings you have available each visit. While this makes it a bit harder to plan if you have a favoured pie of choice, for us it was a great opportunity to finally get a Great North Pie Co pie under our belts. The Great North Pie Co are well known to the Pierateers following several well received pies at the British Pie Awards. However until now we hadn’t managed to locate one due to primarily geographical difficulties. With the Pierateers based primarily in the south of England and the Great North Pie Co unsurprisingly based in the north, our paths had not previously crossed. This all changed in Manchester on our #PieTour, with a visit to the Tib St Tavern recommended by @BadmanMedia. There were 4 pies on offer that evening – two meat and two vegetarian. I went for the “Great North Meat Pie”, which is sold as R&Js Yorkshire Beef, free range pork, black pudding and a range of herbs. For me, the first impressions I got from the outer pie view and when cutting through the pie were that this pie was rammed to capacity with content but did not look overly moist. Often pies ooze out gravy when they are cut open, but this one did not. In fact there was actually a gravy boat provided with the pie and chips, something that we always query as Pierateers. In our opinion, a pie is a self-supported item and should not require an addition of gravy or anything else to make it enjoyable. This is of course not to say that it can’t be thoroughly enjoyed with a side, such as mash, chips or gravy, but the pie should not be reliant on these things. After all, we are pierate and not pieandgravyrate! So with the gravy put on hold for now, I cracked into the pie alone – nothing added to bias my viewpoint on how the pie rated. My thoughts were that this pie was very well filled with meat, with a nice, crisp outer shell of pastry all the way round. Whereas some pies suffer from a soggy bottom, this pie really did not. This is probably partly explained by the lack of gravy in the pie, leaving very little to make the pie base soggy. 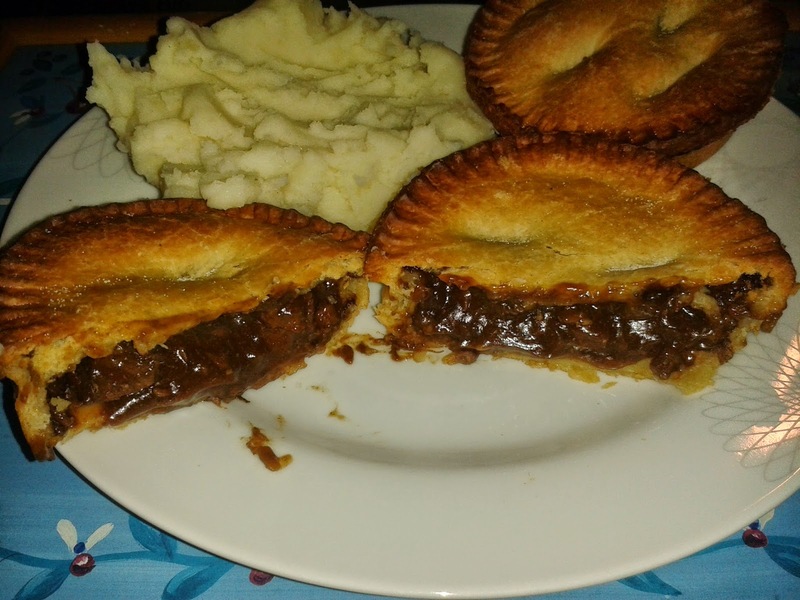 However the meat wasn’t dry – it did well to retain quite a bit of moisture, but the outer pastry shell was a bit dry in places and could have done with a bit of gravy in the pie in my view. I ate the first half of the pie without gravy and then added some gravy to the second half, which helped me enjoy the pie much more. The meat itself was beef based and my main thought was that the pie tasted very much like a burger in pastry. It was after all that type of meat content – very packed into the pastry casing, with beef, pork and black pudding amongst a number of herbs and spices. It certainly screamed of “artisan”! I feel that “artisan” is sometimes overused in the pie community, but these pies from the Great North Pie Co certainly are. Lots of flavours going on; certainly not your typical “steak and ale”! In my opinion it was a little too peppery but in general the flavour was good. 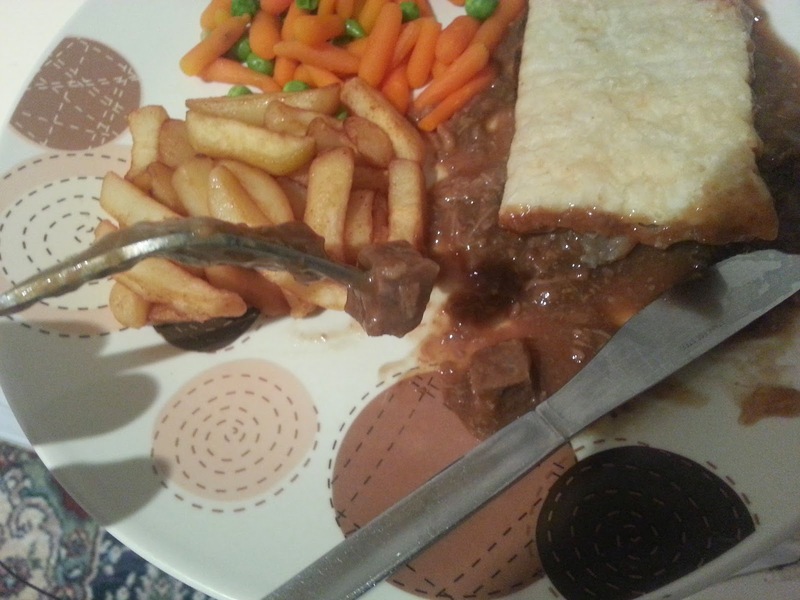 Not quite what I had expected when ordering a beef pie (normally you get beef chunks or minced beef – this was neither!) but certainly enjoyable. I’d expect a pie they make with chunks of meat and a bit of gravy to score even higher than this one. The pastry was crisp and held the pie content in well, particularly as it was so packed. When I first looked at the pie I wondered if it was a bit small, but as it was so full to capacity it was still very filling and it filled the hole. I’d say the pastry:filling ratio was pretty spot on, as the pastry was quite thin but held together well, with a packed filling. There are bigger pies out there but it was a decent size for a meal out. At £8.95 for pie, chips (or mash) and veg, this is a decent price for a city centre tavern pie meal. In summary, a decent pie from the Great North Pie Co. Something a bit different in terms of taste and texture, a little lacking in moisture but complimented with gravy that was fine. I’d prefer it a little less peppery, but for the type of meat pie it was I’d happily have another and certainly look forward to getting my hands on some other great pie flavours from the Great North Pie Co! continue reading "How Great is the Great North Meat Pie?" The Quarter Finals of the World Cup 2014 has thrown up a European heavyweight clash between France and Germany, but it's not just the players on the pitch getting a rating. Oh no! We couldn't let these two teams battle it out without some reference to their pie line ups! So off the back of our England v Italy and Australia v Netherlands World Cup Pie-Offs, here's our third installment! The World Cup Pie-Off idea is simple – a straight head-to-head between the top rated pie from France and Germany. Enjoying the World Cup? Love Pie? 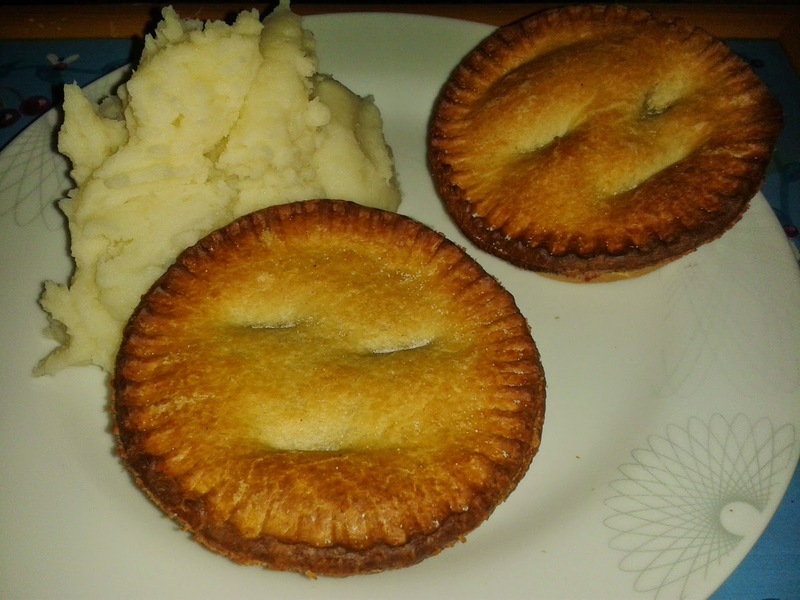 Then our World Cup 2014 Pie Blog is the place to be! Being updated regularly throughout the Football World Cup with pie links and info! As you might expect this was quite a tight battle, with both sides not actually showing great commitment on the pie front. It seems both the French and Germans favour tarts over pies - something we at Pierate are highly disappointed about. However, a pie was found in both countries, so here are the review summaries. The pie from France was found in a local Delicatessen in Morzine after a lot of searches across the country. And boy did it come with a large price tag! Still, we were purchasing a duck and fig pie, so I guess you can expect a bit of a premium on them! The capacity of this pie was chock-full and the flavours were rich and slightly sweet from the fig. An outrageous price tag but then beggars can't be choosers - we have so far struggled to find other pies in France. 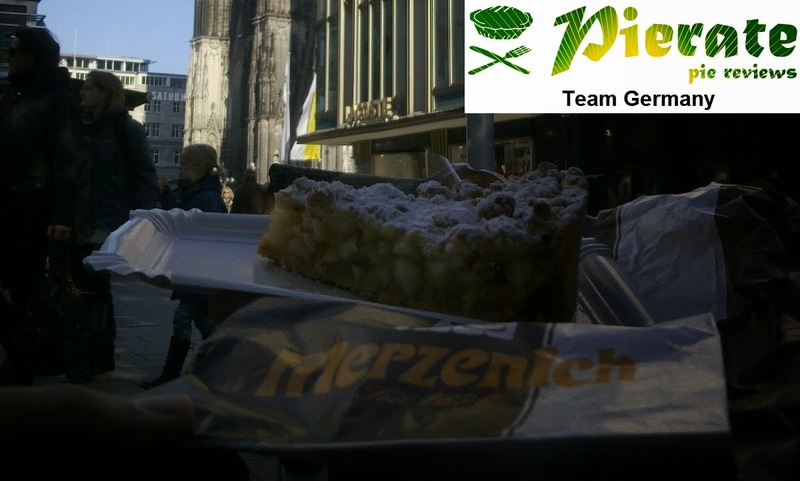 The top rated pie from Germany was found right at the centre of Cologne. It was a sweet pie - as most of the pies (and tarts) we have seen in Germany have been - and the apple flavour is quite typical too. The pie itself was a lovely, sweet apple pie which crumbled beautifully in the mouth when eaten. The beautifully buttery pastry was lovely and golden, crumbling in the mouth. If anything, it was just a little too crumbly to eat easily by hand. Still, it rated well on the 7 Cs. So there we have it - the French pip the Germans on our Seven Cs. Possibly the fact it was a meat (and very expensive meat) pie verses a sweet pie swung it in the favour of the French?! Whether that is the case on the football field, we will see on 4th July! And it seems that we're not the only guys having a World Cup food contest! For alongside our Pie-Offs, the Great British BBQ website are having their own World Cup Sausage contest called "El Sausageo 2014". To see which sizzling sausage wins in their World Cup match offs, visit the El Sausageo website! continue reading "World Cup Pie-Off - France v Germany"